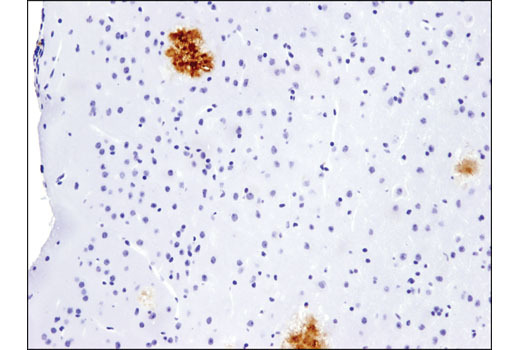 β-Amyloid (pE3 Peptide) (D5N5H) Rabbit mAb recognizes recombinant pE3 form of β-amyloid peptides. 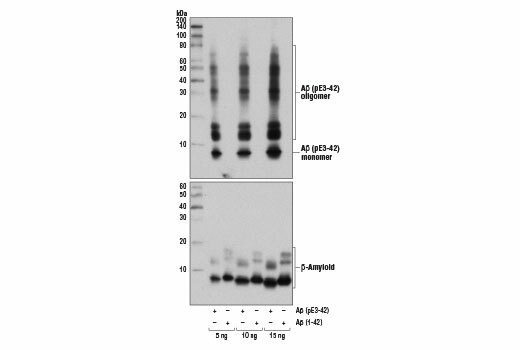 This antibody does not cross-react with the non-pyroglutamate (E3) form of β-amyloid peptides. 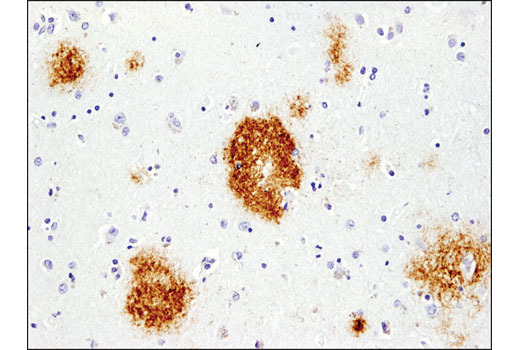 Monoclonal antibodies are produced by immunizing animals with a synthetic peptide corresponding to residues near the amino terminus of β-amyloid (pE3) peptide. Aβ peptides can be further modified by amino-terminal truncation that exposes a free glutamate residue to the enzyme glutaminyl cyclase, which catalyzes the formation of an amino-terminal pyroglutamate (pE) (7,8). 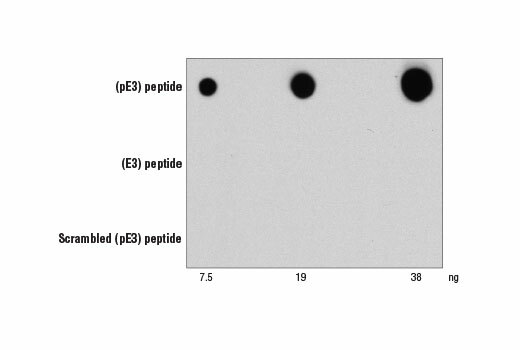 Aβ (pE3) peptides exhibit increased stability relative to non-modified peptides due to an enhanced resistance to peptidase-mediated degradation (9) and a higher propensity to form β-sheets and aggregate (10). 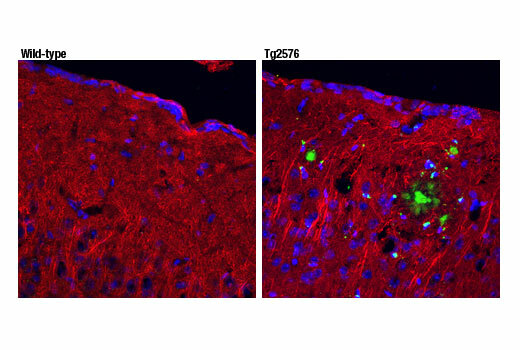 Antibodies targeting Aβ (pE3) peptides may be plaque-specific as there is no evidence for circulating Aβ (pE3) peptides (11). Jawhar, S. et al. (2011) J Biol Chem 286, 38825-32. Saido, T.C. et al. (1996) Neurosci Lett 215, 173-6. He, W. and Barrow, C.J. (1999) Biochemistry 38, 10871-7. Demattos, R.B. et al. (2012) Neuron 76, 908-20.